The Arduino is an easily programmable mircocontroller that can make a seemingly insurmountable electronics engineering feat into a completely doable project with a little circuit design and C programming know how. 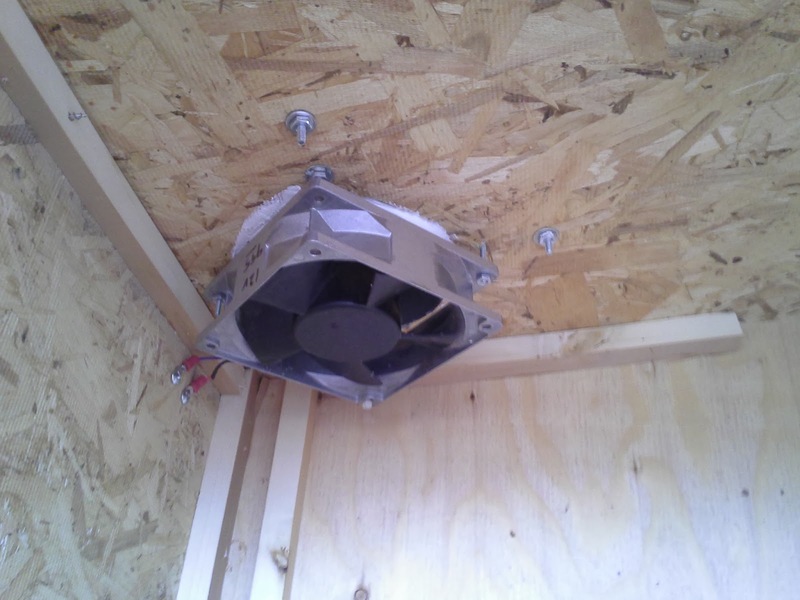 This project will eventually monitor a cold frame air temperature and soil moisture. When the air temperature gets over a threshold fans will turn on. When the soil dries out the irrigation will be turned on. I will also be able to log the temperature and turn on the fans or irrigation remotely through the home wifi. The inspiration came from a Make magazine article called Garduino and an instructables.com article by the same author. Post one is about the power source. This will be battery controlled and solar charged. Here is the complete power setup. 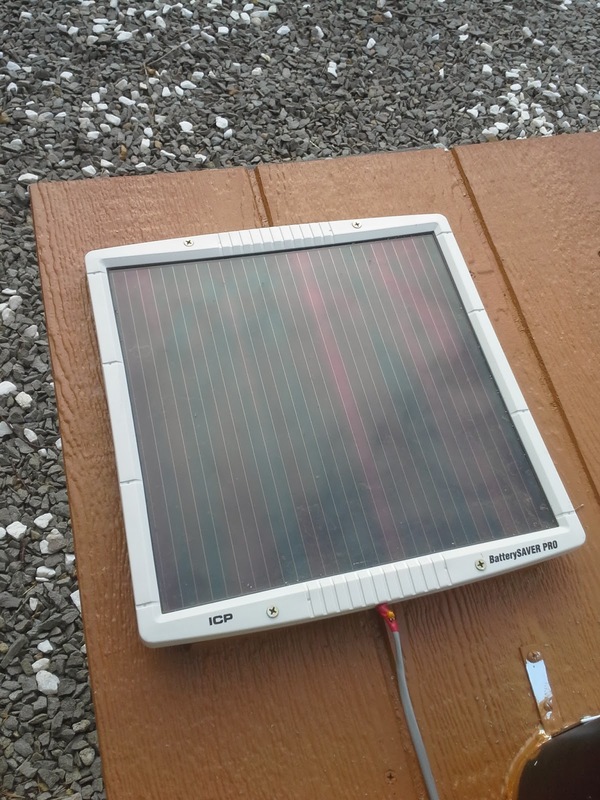 The 10 watt solar panel was one of the most expensive components at $39.99. At 12 volt 8AH battery. This cost $32.99 at Batteries Plus. They are normally used for home alarm systems. They are a good choice since they are designed to be recharged and sealed for low maintenance. This is the voltage regulator. The battery supplies 12v but the arduino needs either a steady 5v or 9v-12v if you use the on board voltage regulator. Since step down regulators are more efficient than the on board regulator and this project will be solar powered I invested the $7.22 to buy a step down regulator to save some power. This is the charge controller. At 3 amp it is more than will be needed. It also prevents over charge and night time flow back discharge. Cost $14.90. With some taxes in it for about $94 (free shipping!) just to power the project. I think those fresh veggies in November will be tasty enough to justify the cost. The next post will be about the sensors. It seems like all I have done for the past 10 years is work on house projects. As I am two thirds of the way though my third house remodel I can say that I am sick of home repair. That is a big reason why there have been no updates for so long. Oh look, another tile job. Lately I have started to take some time to work on garden projects again. Last year I made raised beds and planted fruit trees. 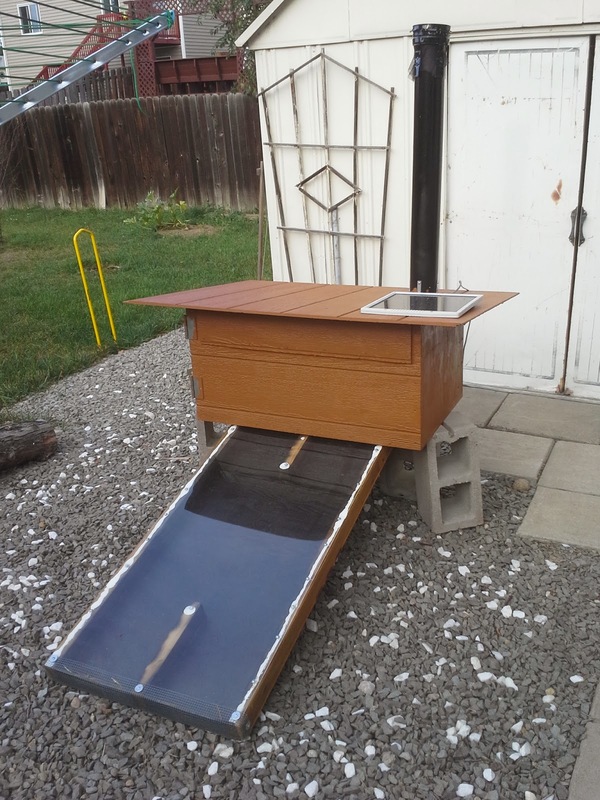 Also made a solar dehydrator last August. After reading about all sorts of dehydrators I went with a basic design. The down draft variety looked interesting but I just won't have that much to dehydrate. It runs off of an old 5 watt panel that I had laying around. About as simple as can be. When the sun shines the fan spins. Coffee can painted black. 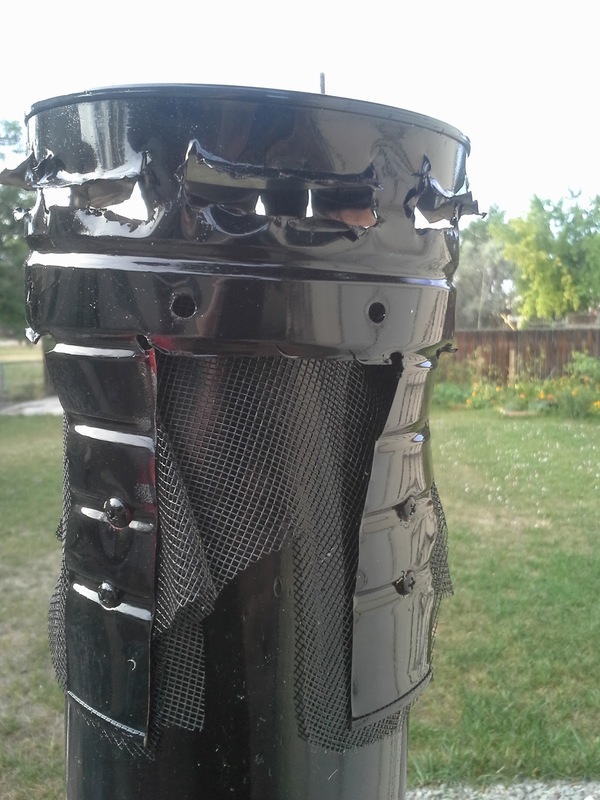 After being in the sun for a couple of hours the shady side of the can was over 130 F.
The solar panel connects to the fan through a couple of bolts in the wall. 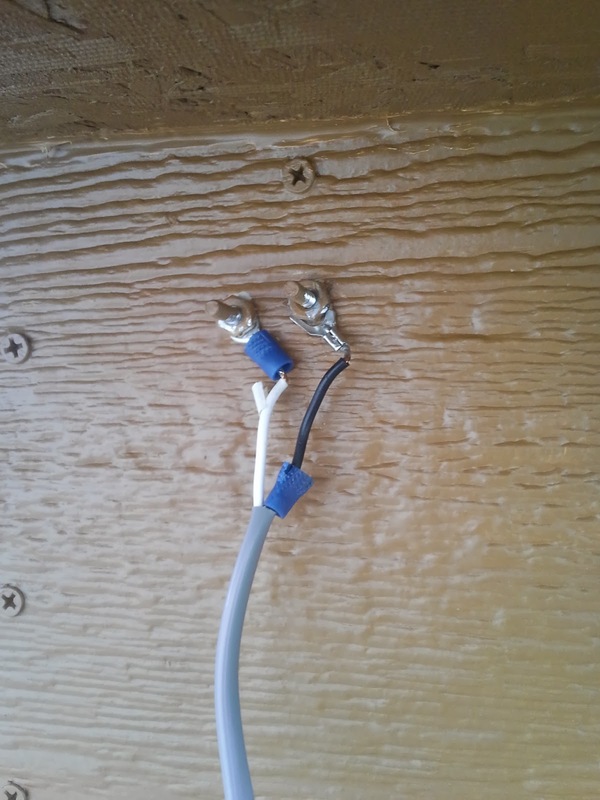 This make disconnecting the panel super easy. A 120mm computer fan that I bought used. They move over 120 CFM at full speed. If I had known how good these fans were I would have bought all they had. After a couple of hours in the sun with the fan going close to full speed the inside ranged from 120 F to 140 F. Colorado is so dry that the heat is dehydrating as much as the air moving over the food. 5 screens that are about 2' x 3'. There is room for 3 more if I ever need them. This was one of those special projects that I did not have to buy a thing for. Finally it payed off to have a garage full of junk. The panels were left over house siding. The fan and solar panel were from old projects. 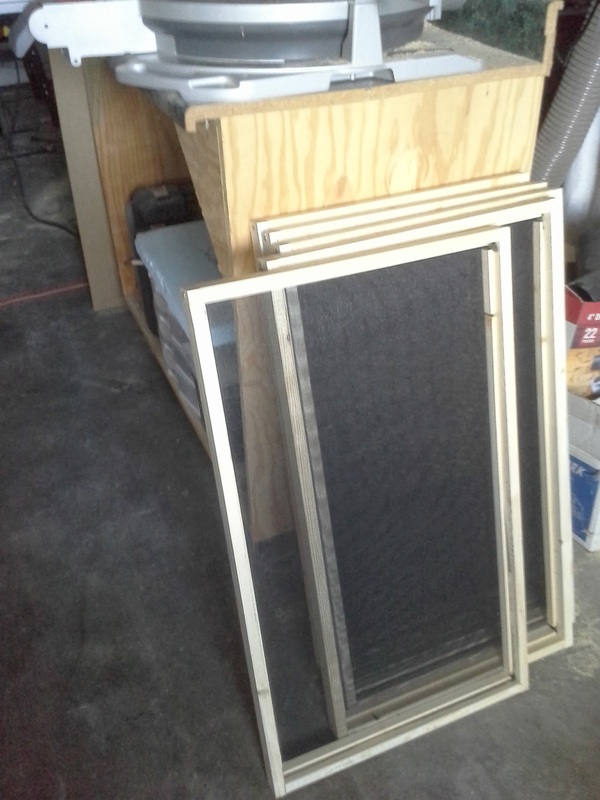 The screen has been floating around my garage since the 90s. The paint and hardware weren't as old but still had been moved at least twice. So far I haven't dried much more than strawberries. They turned out great but were eaten before a picture could be taken. The plan is to dry the apple surplus to feed to chickens in the winter. Last Sunday the chickens were tried and convicted of being food. I opted for the hatchet method as it seemed the most humane and fool proof for the inexperienced. It took much less power than I expected to sever the head and the chickens were more cooperative than I had thought they would be. All in all it was a quick an clean process. I still had an adrenaline rush that lasted several hours. The plucking was tedious. Fortunately there were two other people there who were interested in keeping birds and wanted to get some experience. I scalded the birds in 150f degree water to loosen the feathers but I think the water had cooled off a bit by the time my bird was dunked. It was under 20f that day. Since I ended up skinning the birds and keeping the skin for stock I will probably be less picky about how clean of feathers the birds will be in the future. For the actual butchering I found this web site to be extremely helpful. The first bird took a long time. Largely because we were fascinated with the anatomy aspect. The second bird was done in a few minutes. It had been at least 15 years since I prepared any kind of meat that still looked remotely like an animal. I was strangely comfortable with the process and it was not nearly as gross to me as plucking the feathers. The next morning I ate my first flesh in 13-14 years. The livers were saved and fried with some eggs for breakfast. It was so flavorful that I had to eat small bites to keep from it being overpowering. Now there are 3 frozen bird carcasses in my freezer ready for the crock pot. Some time in the next 2-3 weeks I'm going to have a chicken pot pie dinner/party and invite my friends over to celebrate this mile stone in my life. I've been seeing a lot about The Food Safety Modernization Act going over the internet for the past couple of years. When people first started posting links to the actual verbiage of the law I read about half of it and did not see anything indicating the wild claims that were being made about it. The worst I saw was that it was written with vague language. Granted that vague means it can be interpreted a number of ways but I saw nothing that supported claims like farm animals being marked with GPS radio tags. Since there seems to be no end to recirculating the claims about this bill I wanted to add a small (tiny really) piece of the internet dedicated to reason. This bill is not the problem! Our representatives being controlled by the business oligarchy while parading around as a republic is the problem. By the time the bill gets passed there will be a considerable amount of amendments that benefit the corporate food industry the bill is meant to regulate. This is America after all. House progress has been steady but not worth mentioning in a while. Finally grouted the fireplace, hung more drywall in the addition room, almost finished the drywall in the bathroom, made a room in the garage and hung drywall on it. Nothing is done though. However this isn't all about houses this is about projects and here is the latest. I'm not a holiday person and definitely not a costume person so my Halloween costumes tend to be sparse and allow me to wear my regular pants. This year I'm going as a cetaphobe. Cetaphobia is the fear of whales (Cetacea being the order of marine mammals) and what better place for a cetaphobe than the mountains in the middle of a continent? Any way the costume will consist of carrying around a harpoon. Harpoons aren't the easiest to come by so making one out of scraps in the garage seemed the way to go. First the haft. This is a piece of rough cut red oak left over from a table I made years ago. Through it through the planner, drilled a hole for the shaft, routed the sharp corners and put some boiled linseed oil on it. Then the metal bits. The shaft is left over round stock from a treadle lathe that has been on the back burner for the last few years. The hook is from some sheet stock (14g?) left over from armor making days. I forgot how to braze. After four attempts and a trip to the Depot I gave up and used silver solder. Maybe it was because the flux I was using was from my great grandfathers welding equipment? It looks better with the silver solder anyway. Cleaned up the metal and put some rope on it. I also resurrected the guillotine. It is shorter due to some of the parts having been used for other things but it still cuts melons with frightening efficiency. Earlier this month I had the opportunity to visit an intentional community along the eco-village vein called Dancing Rabbit. They are located in rural northeast Missouri near two other communities. They are committed to creating an alternative to main stream consumer culture. The use of fossil fuels is discouraged as well as new building materials. Here are some pictures of straw bale houses they have built out of local materials and reclaimed lumber. It didn't seem like much was getting done but I was wrong. In July I took a 2 day class on straw bale construction. It was by the same teacher that taught the natural finishes class and although she has a lot of experience and is good with sharing it I was much happier about the hands on the other class had. The class used to be 3 day and losing a day was noticed. We did get to tour some pretty cool houses in various stages of construction. Then the last of the siding was fixed. It doesn't look like much here but it is a vast improvement. Now the house can be painted. There was also an issue with the gutter that was leaking water back behind the soffit. I'm pretty sure the cause has been located and some flashing should fix the issue. There is a curve in the transition between the kitchen tile and living room floor. This means that there is no way to buy a transition strip. The first thing that had to be done was that I had to make a decent router table. The straight pieces were pretty easy and although I've got to redo one that is too short they are essentially ready for varnish. The curved piece is a whole nother story. Probably should be it's own post once it is complete. Some fun was had too. Got to go on two hikes so far this year. I'm looking forward to the kid getting old enough to come along. Next year or the year after? This site is to document my artisan/tinker side and will likely bore anyone but me. Philosophy, politics and diatribes will only be found in small over looked doses.